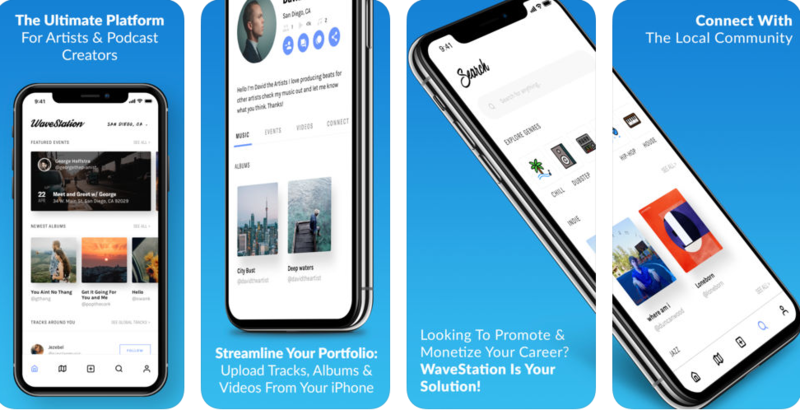 Jumpstart your music career with WaveStation a new, community-focused app! The hottest new app on the scene, WaveStation, is now available to download on iOS! WaveStation is a platform that serves both talented artists and devoted fans. And with tons of positive reviews already flooding in, it’s clear to see that the app is the next big platform for aspiring musicians, rappers, artists, and music enthusiasts. Artists can use the app to promote new singles or albums on a local or even global level. They can do this natively through the app, or kick things up a knotch by hosting their own concerts, parties, or events and spreading the news through the app. It’s very community-focused and personal, which is great to have in today’s fast-paced, impersonal world. If you’re an artist that wants to organically cultivate a following, WaveStation is the app to do it on. Fans can use the app to discover new music, find events to attend, and support artists through WaveTokens. WaveTokens are an exclusive feature that allow fans to support their favorite artists through monetary donations that can be cashed out by linking a Paypal account to the app. Having this direct channel of support makes “keeping the lights on” that much easier for a struggling artist, and clearly shows how engaged WaveStation is with taking care of their artists. Whether you’re an aspiring musician, wannabe rapper, or just a fan of music, WaveStation is there for you. Kickstart your music career – download WaveStation today! Gadget400.com is the part of blogging network which includes exciting blogs like http://apps400.com and http://game400.com. We help you to promote your gadget / app to right target audience and also help you to get better organic traffic and higher position in Google. Gadget400 is looking forward to publish the News about Gadgets, Gadget Market, Emerging Technologies, Buyer Trends, Buyer Tips, How to Guides and Customer Reviews. We are always looking to partner with writers to bring these messages to the community.